BlackBerry pda handsets in Indonesia are not sold in stores or distributors such as mobile phones or PDAs in general. BlackBerry pda tested at this time is the Blackberry 8300. 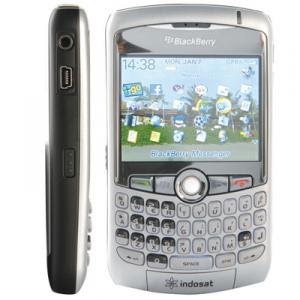 BlackBerry 8300 handset bundling with the operator Indosat. So in addition to this Handphone BlackBerry logo appears, there is also the operator logo Indosat. Design BlackBerry 8300 is not outdated, comes with silver color dominate this body Blackberry, there is black on the side. QWERTY keyboard although in very mini size makes it easy to type when the reply to email or SMS. Located on the left side shorcut buttons to control volume and the camera, while on the right hand side is a mini USB port and 3.5mm stereo headset jack. Micro SD slot is located inside the slot SIMCard. Log in to the main menu, which appears on the most is the icon I-go, the service value added services Indosat. I go through a variety of features can we enjoy such as I-stock, I-ring, I-games, messaging, features, downloads, and others. In one handset we can accommodate up to 10 personal email accounts. Previous to the new customers we need to create a new account in www.indosat.blackberry.com, then add live personal account. Email account that can be integrated into the email account that supports POP3 or IMAP, such as Yahoo! Mail, Gmail, fastmail hotpop and others. This means if we have more than one email can be combined in a single inbox messages. So we can check the incoming email is received a message, such as when we make a reply SMS. Video test when sending email with attachment file image with resolution 640 x 480 pixels at 99 kb from Yahoo! Mail to a BlackBerry 8300 in a matter of no more than 5 seconds are up. And when opening the file attachment image takes no more than 10 seconds with a choice of 320 x 240 resolution. In addition there is also the option to download the file with the size of the original post (Full Image). In addition, the results was tested upload photos of 2 Mpix camera with a maximum resolution of 1600x 1200 size of 600-700 kb. Photos are uploaded to the site via email Flickr, average takes between 3-8 minutes.